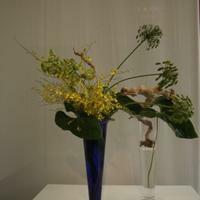 The National Museum collaborated with the award-winning firm of Escher GuneWardena Architecture to design the exhibition Living Flowers: Ikebana and Contemporary Art. By adapting Japanese architectural elements such as shoji screens and tokonoma, their design dramatically transforms the National Museum’s galleries and underscores the exhibition’s focus on the interaction between traditional art and contemporary aesthetic practices. Principals Frank Escher and Ravi GuneWardena grew up in Switzerland and Sri Lanka, respectively. They have been based in Los Angeles since the mid-1990s, but their projects, which address issues of sustainability and affordability, can be found in the United States, Canada, and Europe. In 2004 they were selected to design the Dwell Home II, a prototype for a sustainable house. 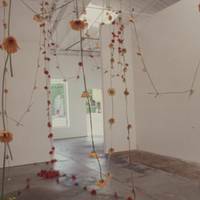 Their interest in contemporary art has led to collaborations with artists, galleries, and museums, including the design commission for the 2008 Carnegie International in Pittsburgh, which is the premier North American showcase for the best new art and artists from around the world. 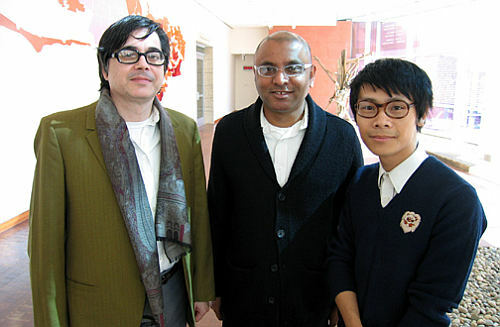 Frank Escher, Ravi GuneWardena, and designer Chao Trang at the Japanese American National Museum, 2008. This article was originally published in inspire, the Member magazine of the Japanese American National Museum, in the Volume 2 (Summer 2008) issue.